Superman and Wonder Woman are flying together above the clouds. They speed toward some storm activity off the coast of Norway. Superman is confident about handling the disturbance quickly; and says they will be having dinner in Oslo before long. Superman uses his X-ray vision to spot a plane in trouble. Wonder Woman says she will handle it, and heads in that direction. Meanwhile, Superman heads toward the center of the storm to try and neutralize it. Superman spots something that upsets him; but for the moment, we don't know what it is. We now switch scenes to an earlier time. Clark Kent is at the Ace of Clubs in Metropolis. Clark and Cat Grant are discussing a joint venture, creating a high-profile news blog. At the same moment, Wonder Woman is in London, and is sparring with fellow Amazon Hessia. Hessia yields, saying she is older now and not in shape to keep up with Diana. Wonder Woman remarks that she is not sure if she will ever age, having a god for a father. Clark is introduced to Cat's new boyfriend, but leaves the bar as soon as he can without being impolite. Meanwhile, Diana confides to Hessia that she dislikes the secrecy in her relationship with Superman, and wishes it was out in the open. 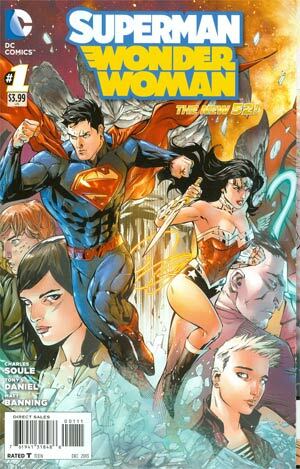 All along, some unseen person is gathering data about the Superman-Wonder Woman alliance. Back in the present, the plane has lost its main engine, and is in a nose dive, going down quickly. It is a military plane, not a commercial aircraft. With some effort, Wonder Woman grabs the plane and levels it out. Suddenly, Superman is hurtling upward out of control, and smashes right through the plane, rather explosively. With a sense of urgency, Wonder Woman rips the roof right off and grabs the two pilots. She gives them to Superman to take them down, since he is a better flyer. Superman indicates that something hit him hard, sending him out of control. He asks Wonder Woman to stay put until he returns after taking the pilots down. She has only a moment to consider his request when the plane explodes violently. Wonder Woman takes the full brunt of the explosion, and is stunned. We see her in free-fall, heading toward the water below. Our focus again shifts to an earlier time. In London, Diana waits on a balcony for her boyfriend to arrive. Clark shows up in casual attire, holding a very exotic, other-worldly potted flower from his Fortress. He tells her not to water it, but to use cooking oil instead. As they chat, Wonder Woman mentions her displeasure that they are so far keeping their relationship a secret. Clark explains that he wants to do this for privacy reasons; saying they give the world so much; but he wants to save this one thing just for the two of them. Wonder Woman indicates that Clark, although immensely powerful, was never trained to fight. She, on the other hand, studied under the god of war. She says she is just the person to train him. In the recent past, we see that Clark and Cat have set up shop in downtown Metropolis, and are already receiving a lot of mail. Back in the present, a warship from the Royal Norwegian Navy has fired the missile that momentarily stunned Wonder Woman. The captain has misunderstood the behavior of Superman and Wonder Woman, believing that they deliberately and maliciously destroyed the military plane. Wonder Woman, not at all happy that the Navy ship fired upon her, is busy dismantling their forward gun mount. She is in a rage, because they shot a missile at her while she was trying to save the pilots in the plane. Suddenly we see who attacked Superman. Doomsday lands on the deck of the ship. 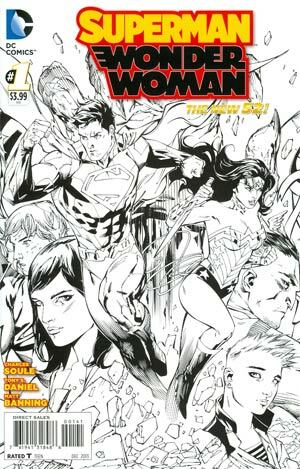 He rips apart the two pilots rather gruesomely, and is now staring down at Wonder Woman. As Wonder Woman enters into a fierce battle with Doomsday, we see in flashback her and Clark playfully bickering, because the Justice League contacted Superman, not her, about the storm. He claims to be "good with storms," but she says she is just as good. They were cuddling when they were interrupted by the Justice League message. They believed they were heading into a routine situation, and that they would handle it quickly and have time to get to their dinner and resume cuddling. But their day is not going as planned. 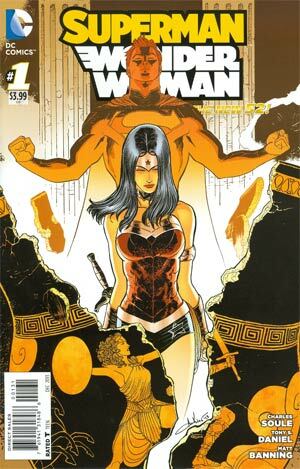 Focus returns to the present, as we see Wonder Woman grappling with Doomsday; looking bloody but determined. Story - 5: I loved this issue! This is a very promising start to what should be a great new series. This story is not told in a linear fashion. The story jumps around, with the action scenes happening in the present, and earlier, quieter character-driven scenes interspersed. This technique is used often in today's DC comics; but it is especially effective here. 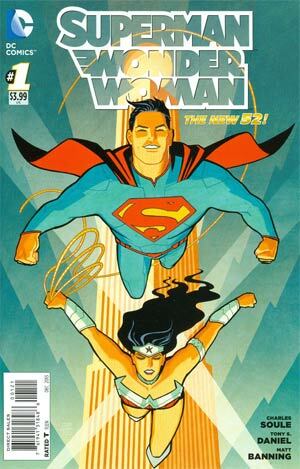 This series will be all about contrasting the personalities and ideas of Superman and Wonder Woman. In some ways, they are absolutely perfect for each other. But in some ways, they are very different personalities. Their personalities will occasionally clash. We see hints of that here. She is assertive, and rather competitive. She has an independent streak, and does not like to be controlled. She was raised as a warrior. He is more laid back, easy going, much more secretive. He is almost a pacifist; and would always look first for the diplomatic solution instead of an altercation. All of these things are a result of their very different origin stories. You can thank Jonathan and Martha Kent for Clark's gentle personality. And Wonder Woman's more assertive personality is a result of growing up on Themyscira, an island without men where training in martial arts and weaponry is a way of life. Look, for example at Wonder Woman's two conversations about the secret nature of their relationship; first when she confides to a friend, and then when she confronts Clark directly. But if she is so eager to come out of the closet with their relationship, does she want to reveal Superman's relationship with Wonder Woman, or Clark's relationship with Diana? Or both? At some point, Diana will figure out that secrecy is inbred into Clark. He takes his secret identity very seriously, because his parents were so worried that if someone learned that an alien was living with them on a Kansas farm, they would lose Clark and their lives would be changed forever. At some point, Wonder Woman will be much more understanding and compassionate about this. And at some point, Clark will relax and take the risk of going public about his relationship with Diana. Superman is very protective of Wonder Woman. He is, in fact, a very protective person overall. But she is not about to like it. Take, for example, the scene when she rips open the plane to save the two pilots. Superman is heading down to drop the pilots off on the deck of the warship, but first begs Wonder Woman to stay put and not go down to tangle with their dangerous adversary. He asks her to wait until he returns. She has a scowl on her face, and starts to say something uncomplimentary about Superman, until a missile explode right in her face and interrupts her thoughts. He is always going to be especially protective of her or anybody else he loves, because he is the most powerful being on the planet. But as a trained warrior, she will not like being under his protection. Ever! Another scene that fascinated me: the sword. If this sword was fashioned by Hephaestus and is "staggeringly powerful" and can truly split an atom, then it is a safe bet that it could slice Superman up as well. So what does she do? Wonder Woman starts swinging this powerful weapon right at Superman, trusting he will be fast enough to get out of the way. She does this to make a point; but she should not be risking his life just to make a point. It is definitely not surprising that she wants to train Superman in the ways of war. Poor Superman. In this continuity he will struggle more in his romantic endeavors. An afternoon with Wonder Woman is a whole lot riskier than a date with Lois Lane. One more example. When the Justice League contacts Superman, not Wonder Woman, to handle the storm, and he expresses confidence in his abilities for that assignment, she gets a little bit testy. She claims to be as "good with storms" as he is, or perhaps better. She is wrong. With heat vision and cold breath, he is the perfect candidate to tackle that storm. It may seem like I have been a little hard on Wonder Woman in this review. But the truth is that I am a big fan of Wonder Woman. At her heart, she is a compassionate person. In her defense, she grew up on an island without men. If men were discussed at all, it was probably in disparaging terms. So it is no surprise that she will struggle a bit in romance, at least initially. Their relationship truly has great potential. But they will first have to grow and learn a lot about each other, and become very understanding about their differences. When that happens, they will make a great "Power Couple". Art - 5: This artwork is just terrific! The action scenes have a great energy. And the quieter scenes have a soft, romantic feel. And there are some special touches I like; such as Diana's reflection on the sword when she shows it to Clark. My favorite image may be them flying together on the title page. But I also love the small image of them looking at each other after he gives her the flower. I am talking about the image at the top of the page, where neither one of them says anything. The chemistry between them jumps off the page. Cover Art - 5: I love the wrap-around cover. The cover art is very strong; worthy of an issue #1 of a new series. 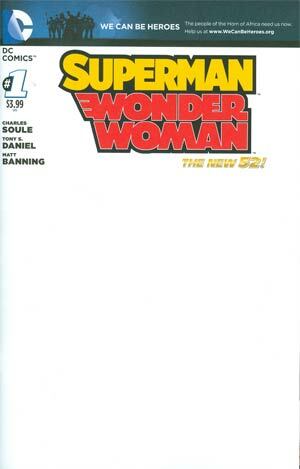 Cover Art (Cliff Chiang Variant) - 4: This is a strong cover, but I like the original better. 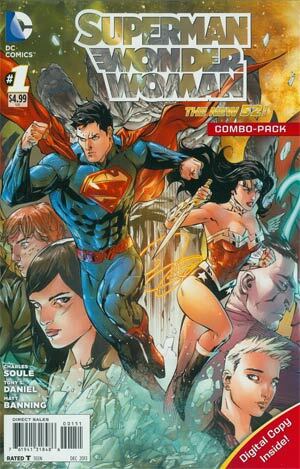 Cover Art (Aaron Kuder Variant) - 3: Same goes for this variant cover as well.